Asthma Flares from the Dust and Mold in Your Vents? Recent health and allergy issues due to the debris in your home? If you suspect that your vents need a deep cleaning, contact Quality Air Solutions today! Do you remember the last time your dryer vent was cleaned? If not, then your dryer vent may be due for all of the lint and debris build up to be cleared! If you’re curious how much lint there could be, watch this video of one of our Quality Air Solutions team members cleaning out a dryer vent in Olney, MD. 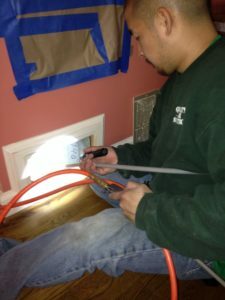 “Quality Air Solutions cleaned my dryer vent. They did a great job getting rid of the build up. My vent has several bends and travels a long way to exit the house. I’ve use this company before and highly recommend them!” – A.C. in Rockville, MD Worried that your dryer vent is too bendy and complicated to be successfully cleaned? 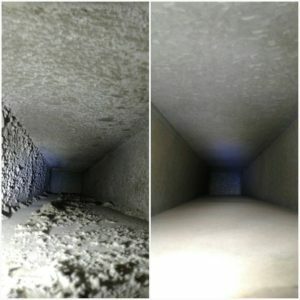 The Quality Air Solutions team has years of experience cleaning air ducts and can handle the job! Contact us today! Our team uses a powerful gas air compressor (pneumatic air tool) to clean the return ducts of a residence in Bethesda, MD. Is the quality of your indoor air suffering and the air is full of pollutants due to your clogged ducts? 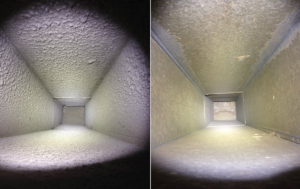 Contact Quality Air Solutions for a successful, thorough duct and vent cleaning!